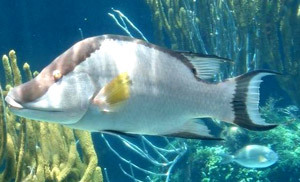 A Hogfish at the Aquarium developed a tooth problem and proceeded to grind the offending tooth up and down the tank window scratching the acrylic surface, the Bermuda Aquarium, Museum & Zoo [BAMZ] newsletter said. BAMZ said photos of the scratches were sent to an expert overseas for removal estimate, which was a “staggering” $15,000. The newsletter said: “In November, our male Hogfish, on display in the Northrock tank, developed a tooth problem with one of its large, incisor-like teeth. This was evident by how the fish indicated to us it had a problem. “Over the course of one day he proceeded to grind the offending tooth up and down the main display window of the tank. Normally, this wouldn’t cause a problem with a glass window; however, the Northrock tank windows are made of acrylic. The Hogfish was transferred to a smaller tank with a glass window and he was successful in removing the problem tooth on his own. The scratches will be removed by divers from US-based Exhibit Solutions in early February. That’s going to be a pain to keep clean in the mean time! Fortunately the colder water should retard algal growth for the time-being. Thanks I needed a little laugh. Eat the culprit – I wonder it tastes different than the Sound ones. At least it used his head n got rid of the problem n pain. Commend him for bringing it to your attention, it had a toothache!! !before a more serious problem occurred! And….NO!! !…..neither WHOLE or STEAKED…..let it swim !!! The incident occured at tooth hurty in the afternoon. Only in Bermuda would this make news! Reasons why I love this country so much! Poor fish I hope you get better! What a clever Hogfish! I’m crazy with a toothache myself at the moment.. so feeling his pain.. Repair to tank almost as much as the dentist bills.. Ouch!